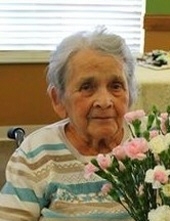 CHRISMAN- Betty Lou DePlanty, 89, of Chrisman, Illinois passed away at 2:55 am Friday, February 1, 2019 at Vermillion Convalescent Center in Clinton. She was a homemaker. She was born April 28, 1929 in Clay County, Indiana to the late Hubert Featherston and Margaret Lamb Featherston. Her husband of 50 years, Roy O. DePlanty who she married November 28, 1946 preceded her in death on November 14, 1997. Survivors include one son, Bob (Gayle) DePlanty of Rockville; one daughter, Linda Hoesman of Sullivan; seven grandchildren and 10 great-grandchildren. She was preceded in death by a son, Jim DePlanty; son in law, Mitch Hoesman; great-grandson, Ethan Hoesman; brother, Russell Featherson; three sisters, Velma Jean Davis, Wilma Featherston and Mary “Kate” Jones. Services will be 3:00 pm (EST) Sunday, February 3, at Gooch Funeral Home, 112 W. Howard Street, Rockville with Bob DePlanty officiating. Burial will follow at Wesley Chapel Cemetery in Scottland, Illinois. Visitation is from 1:00 pm until 3:00 pm Sunday. To send flowers or a remembrance gift to the family of Betty Lou DePlanty, please visit our Tribute Store. "Email Address" would like to share the life celebration of Betty Lou DePlanty. Click on the "link" to go to share a favorite memory or leave a condolence message for the family.